The EC700​ series crawler excavator and the L180​ wheel loader both received a Lowest Cost of Ownership award while the L20​ wheel loader was given a Highest Retained Value award. The leading data researcher for the construction equipment industry EquipmentWatch has selected two Volvo Construction Equipment (Volvo CE) machines for its 2019 Lowest Cost of Ownership Awards and one Volvo CE wheel loader model for the 2019 Highest Retained Value Awards. 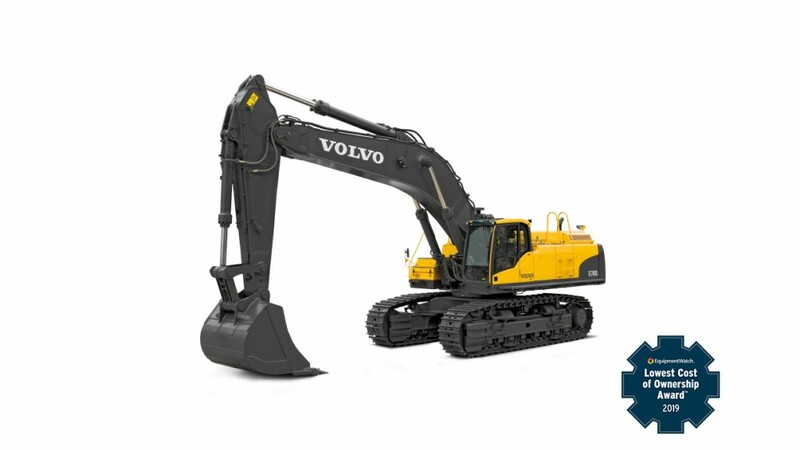 The prizes underscore Volvo CE's commitment to providing the highest uptime in the industry and the best value at every stage of a machine's lifecycle. It's the fourth straight year that EquipmentWatch recognized Volvo CE with awards. The EquipmentWatch annual awards are based on extensive analysis of millions of data records to determine which model series retain the highest percentage of its original value and lowest five-year total cost of ownership. EquipmentWatch analysts looked at the most popular equipment series observed on the resale channel over a 12-month period in 2018. Volvo CE's machines were chosen for their projected value retention over a five-year period. "We are honored to receive these awards and appreciate that EquipmentWatch is providing such an insightful service to the industry," said Stephen Roy, president sales region Americas, Volvo CE. "We are dedicated to achieving the highest lifecycle values in the industry. By awarding Volvo CE, EquipmentWatch's analysis of ownership provides that our values are appreciated in the marketplace and that we are delivering well against them." Volvo CE's EC700/EC750E excavators won in the Large Crawler Excavator size class (>50.0 metric ton) category and the L180H wheel loader won in the Large Wheel Loader (>250 horsepower) category. The L20F/L20H wheel loaders won in the Small Wheel Loader (1-134 horsepower) category. "The goal of the EquipmentWatch awards program is not only to help equipment buyers objectively understand the best performing machines," said Garrett Schemmel, vice president, EquipmentWatch. "The program is also designed to recognize manufacturers for building these higher quality, durable, and cost-friendly machines that power our industry." The L20F/L20H wheel loaders won in the Small Wheel Loader (1-134 horsepower) category. The L180H wheel loader won in the Large Wheel Loader (>250 horsepower) category.